Muslim terrorists in the Philippines. 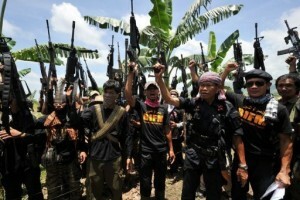 Christians in the Philippines are concerned over the rise of Islamic extremism in the country. World Watch Monitor sat down with a local church leader and he told them about a meeting of around 3,000 Islamists on one island. “The villagers – Christian or not – are all in fear. At night, the Islamists coerce men into going to the mosques. Some men have never been seen again… When they see you out on the street, they’ll come get you. One man who went to the mosque on 6 February never came back home,” the pastor told them. The Islamic State has gained influence in the Philippines since the jihadist group Abu Sayyaf declared their allegiance to ISIS in 2015. On February 27, Abu Sayyaf posted a video of the beheading of a German hostage, after the deadline for paying the ransom expired. The Philippines is on a list of “countries of concern” for Open Doors, a global organization that advocated for persecuted Christians. Article mentions a group called BIFF, without explaining this abbreviation.